A beautiful weekend-away trek encompassing the best scenery Central Chile has to offer. Stunning panoramic views over the volcanoes of the region, a picturesque crater lake and beautiful forested valleys. Best of all it's easily reachable from Santiago by public transport! November to April but beware as snow can linger on the path down to the Laguna till December so it may be advisable to come prepared for snow if done in early November or late April. From Talca take Route 115 toward San Clemente. 40 miles from Talca divert to Vilches, turning left on a paved road in good condition. From here it is 29 miles, the first 9 of which are paved, the rest is a gravel track in good condition. Buses Vilches goes from Talca bus station (opposite the Pullman and Tur Bus terminal) to the entrance to the park, you can get slightly further by car. Departures are currently (2009) 7:15, 12:00, 13:00 and 16:50 (an extra at 19:30 on Fridays) Monday to Saturday, returning at 7:15, 9:15, 13:50, 17:10 (an extra at 19:15 on Fridays). On Sundays and bank holidays the 7:15 changes to 8:15 and the bus back at 9:15 departs at 11:50. It costs $1400 each way and takes approximately two hours depending on how packed full of people it is and how much mail they have to deliver. It is also much quicker on the way back as it is going downhill! Follow the dirt road another couple of km to the administrative entrance and then on to the camping (the site with facilities). 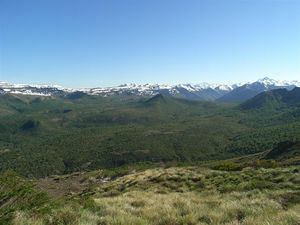 From here the trail is clearly sign-posted to the right on a large well-kept track of the Sendero de Chile. From here it's another couple of km to the first campamento (site without facilities). After the campsite the path turns into a small gully with a stream and back out the other side where a clearly signed path branches to the right marked the Laguna del Alto. Taking this the path climbs approximately 600m in 3km out of the forest cover and onto the Plateau above. At one point it veers to the left until it is almost horizontal with the slope but don't worry and keep following it until it turns back in on itself higher up. Once on the plateau the path spits in two. Take the marked path to the right. After about 1km of flat walking the path descends over a ridge and down 150m into the crater lake below. Significant amounts of snow can linger into December making the path hard to find but don't worry there are other arguably easier routes down to the Laguna. The actual path goes off to the right from the sign post at the top of the crater and comes back down to the left coming out on the bottom of the Laguna. From here it is also possible to climb Cerro Paine although this makes the day a long one and the winter gear is required all the way into December. The banks of the lakes are a perfect spot for a quick break before ascending back up the way you came to the top of the crater. From the signpost at the top take the branching path to the right and not back the way you came. 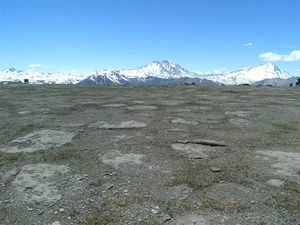 The path is obvious all the way as it makes it's away across the plateau, occasionally marked with cairns and parallel lines of rocks. After about a km the path joins with the fork we ignored earlier and makes it's way along the lower left side of the plateau through interesting volcanic rock formations. After 3 km the path reaches to Enladrillado, a flat rock plain which can be seen clearly from a distance away. Much is made of the apparently strange UFO launch-pad nature of this rock platform but what really impresses is the stunning views of Descabezado Grande (the Decapitated volcano) and Cerro Azul straight ahead, the beautiful forests and valley surrounding them and the endless views of the high snow-capped volcanoes that stretch down the backbone of Chile. Once you've spent a sufficient amount of time soaking in the views take the clearly marked path to the right down off the plateau that you passed just before reaching Enladrillado. From here it's about 3km and 400m of decent down to the second of the campamento's at the base of the plateau. It's then another fairly flat time consuming 4km back to the first campamento and then out the way you came in. It should take about an hour and a half to get from the gate to the first campamento. About 2 hours to the Laguna. 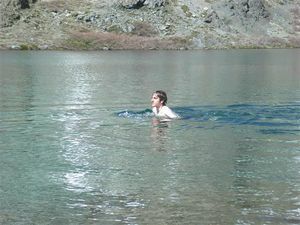 1.5 hours from the Laguna to Enladrillo. 1.5 back to the first campsite and another 1.5 to the gate making it roughly 8 hours in total (probably about 9 with decent sized breaks). While this trek can be done in one exhausting day it is hard to see why you would want to unless you lived nearby. Instead there is plenty more to see in what is a beautiful national reserve (Altos de Lircay). Doing this trek in one day from one of the campmentos at the bottom of the plateau is highly recommended (the first is less crowded), hiking in and out of the park on the days either side or hiking one of the other numerous trails in the park. This trek can be done the other way round but this would involve doing the long boring walk along the valley at the start of the day and getting the best views at the begining rather than towards the end. Camping at Laguna del Alto is now forbidden for fear of contaminating the Laguna. It is also possible to climb Cerro Peine from the camping towards the entrance of the park and then continue on the trek from there. Snow can hang around the sheltered Laguna for a surprising long time so in November and April an ice axe is probably best if available or you should be flexible in your plans. Trekking Chile's (who produce surely what are the best maps available in Chile) Condor Circuit map cover the whole of this area. The map is a dream for its accuracy, clarity and detail however it is more tailed towards GPS users. It is also not immune to errors as it claims you can camp at Laguna del Alto which is now forbidden and does not contain the path up Cerro Peine from the camping. The only alternative would be an IGM map. Altos de Lircay circuit. 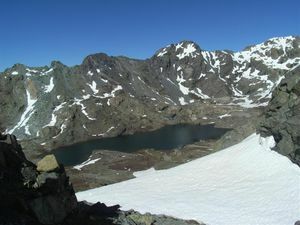 It includes the normal route to Laguna del Alto, the crossing of the plateau till Enladrllado and the way back along the Lircay valley. To download the file right-click and then select "Save file as" (IE) or "Save link as" (Firefox, Chrome). By trying to open it directly, some browsers will show the raw code with the coordinates.